Why Walter White is like GOP. It’s hard to ignore the metaphors so abundantly offered to us, to use at our discretion, by the writers of Breaking Bad. When I first started watching Breaking Bad this past August – a one week crash course of watching the entire 5 seasons, holding my breath and with my jaw on the floor – I found myself celebrating Walter White’s liberation, even though it came via abominable means. The meek and scared school teacher making $43K a year, stepped upon and humiliated by his students and his car wash boss, with terminal diagnosis, a few thousands to his name in the bank, in those ridiculous tighty-whities, those “sensible” Clarks shoes, driving that pathetic Pontiac Aztec – how could one not feel sorry for the guy and not cheer his finding his mojo? How could an average middle-class working man not relate to this character? But it would be naïve to expect that line of story – Walter White, the kind and powerful drug kingpin who only seeks to provide for his family – to keep us on the edge of our seats for 5 years. Turning him into a Hulk-like character would be, no pun intended, a death sentence. 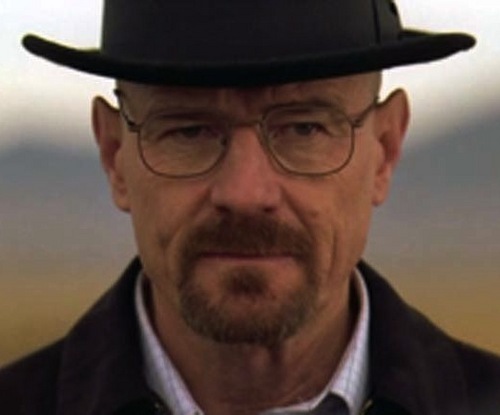 “Provide for his family” – a guiding mantra that we hear from Walt White throughout the entire series, while being an initial justification for his new occupation, at this point is just an illusion in Walt’s mind. The damage that his actions brought to those dear to him is beyond repair. Walter White has created a monster. And then lost control of it. GOP, the moderate, mainstream, Rockefeller-type that dominated US political arena for decades has been devoured by Uncle Jacks that, when GOP called on them, came and collected. Without them the GOP is impotent, with them the GOP is doomed. Now Walt is in a corner, just like the GOP, from which it’s hard to get out without either admitting the wrongdoing, the entire premise of your existence for the last few years (or decades) and inability to do the right thing. Surrendering would negate his life’s work – leaving his family in a worse shape than when he started on this path. Digging his heels seems to be the only option to his entrenched mind. Control and self-aggrandizement. Yeah, like this guy – the Uncle Jack of modern Republican caucus, only with more piety and a Harvard Law degree. Do you think he would hesitate to pull the trigger on things America needs now if it served his own interests and ambitions? Hell, he’s already pulling it. GOP has created him but now they’re having second thoughts. Walt White having second thoughts on the Uncle Jacks Nazi crew is an understatement of the year. We’ll probably see a great finale. In both cases. Thoughts on Republican presidential field. You gotta feel sorry for Republicans. I do. Now that Christie is out it comes down to Romney vs. Cain. To a collective gasp for both moderate Republicans and Tea Partiers. I think it’s time for us on the left to stop calling Tea Parties racist, since from the copious, albeit unsatisfactory, field they ended up preferring a black guy. I also look in amazement at how much they must hate Romney! Losing Christie has deprived us from a promise of a good fight. He would be a formidable opponent to Obama. I guess Tea Partiers like Christie because he’s always angry and moderates like him because, anger aside, he’s rather middle of the road in his views on guns, gay marriage, and in general he errs on the side of getting things done rather than sticking to rigid principles. Not that I’d root for him, but he seemed like the most decent, honest and straightforward guy among the roster. I also have a few words on Rick Perry. In my view, he showed his human side when he called those who want to deny illegal immigrant’s children a chance at education “heartless” only to be quickly brought down from the pedestal by the same people who elevated him there just a few weeks ago. They certainly didn’t like to hear the truth about themselves even coming from a gun-toting, death-penalty loving Texan. I’m afraid that with so many requirements for a perfect candidate and unwilling to compromise on any of them the Tea Party will never get laid. From my partisan standpoint I like what I see in the opposition camp. But from the broader and more significant perspective I weep together with and for moderate Republicans for what the party of Lincoln and Regan has become. That’s the best you’ve got? In the whole South and the Midwest, from the plethora of Republican governors and senators, you’re down to flip-flopping guy from Massachussetts and a black guy who has never held a public office (the last one is particularly ironic). You refuse to even give a good look to Jon Huntsman or Gary Johnson or even to Ron Paul, for Christ sake, who loves your Ayn Rand so much as to name his son after her. Btw, since I mentioned Jesus and Ayn Rand in the same sentence let me expand on it: if Jesus and Ayn Rand married and had a child together the Tea Partiers would still be unsatisfied: Atheist who loves the poor, what a nightmare! The best thing for Romney, should he get the nomination, would be to pick Marco Rubio, a Florida senator, for VP spot. Tea Partiers love him, he can attract the Hispanic vote that went overwhelmingly for Obama last time and they will have groomed the next GOP presidential contender for 2018 or beyond. Obama has to use the 14th Amendment. Obama should invoke the 14th Amendment to the Constitution that states the following: The validity of the public debt of the United States, authorized by law, including debts incurred for payment of pensions and bounties for services in suppressing insurrection or rebellion, shall not be questioned. First of all it will force the party of “personal responsibility” to pay their debts. Let me remind you that the debt ceiling needs to be raised not to expand government spending in the future as our far right folks think, but to pay for bills that already have been incurred in the past, mostly by the same personally responsible, fiscally conservative party, like paying for wars, Bush’s tax cuts, and interest on the existing debt. (Obamacare has not kicked in yet, just so you know). Second, if someone will still question the legality of the move, he or she can take it to court. I can’t wait to see what sort of personal injury or loss of property they will claim to suffer from the event of NON-default. Well, I can imagine PIMCO folks or others who shorted Treasuries counting on default to have a monetary loss, but just picture them in front of US Supreme Court with this! Third, I don’t think the Tea Partiers in Congress understand the whole seriousness of the situation. They are looking at the default as if it’s a tool to use against Obama and not something that will hurt them or their constituents in the end. Politicians who engage in political posturing to placate their caucus is one thing, everyone does it, but Tea Party block are true believers – they really do want US to default, all be damned. “That’ll show’em!” – they think. They need to get some education from some wily lawyers who used to run the show in Congress, but who also know what a compromise is. When grandma or some average Joe investor or some contractor doesn’t get paid – who cares! But when Wall Street gets nervous and when Tea Party financial spigots are scratching their heads at a bunch of hillbillies they sent to Congress – that’s a wake-up call. When Wall Street feels like it won’t get paid – they will make sure their message gets through. And that’s where, with all my antipathy towards lawmakers, I would prefer crafty lawyers to uneducated hacks. The hacks that love the Constitution so much they want to amend it. The same hacks that love America so much they want her to default. And lastly, Bill Clinton says he would use this amendment “without hesitation” and “let them challenge me in court”. This alone would be enough for me!